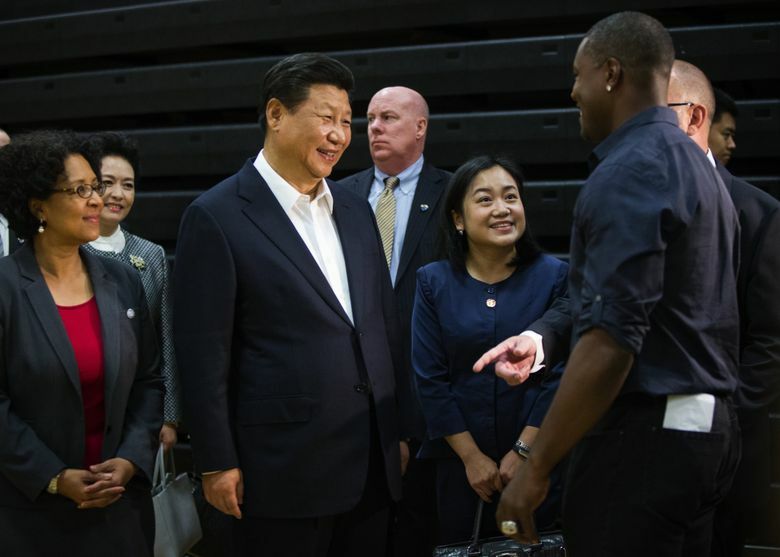 Tacoma’s Lincoln High School played proud host to the Chinese president Wednesday evening, then received a surprise gift: an invitation for 100 students to visit China. 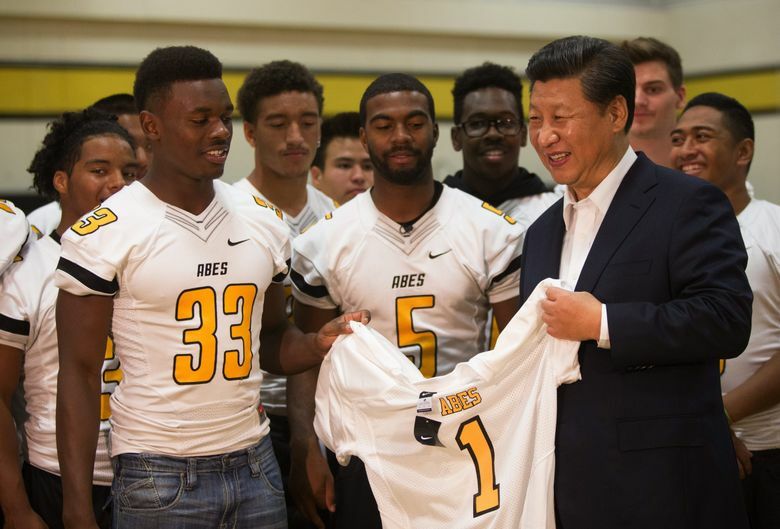 TACOMA — Chinese President Xi Jinping came to Lincoln High School bearing gifts. There were books and pingpong accessories, displayed behind Xi on Wednesday night as he spoke before an audience of several hundred in the school’s auditorium. And then the Chinese president — collar open, no tie, end of a long day — invited 100 Lincoln High students to visit China next year. Through travel, “you will know China better, and hopefully you will fall in love with China,” Xi said. The audience, students and dignitaries, and Xi’s wife, Peng Liyuan, cheered. It was a light moment for Xi in a heavy visit to the United States, full of meetings with governors and CEOs over the past two days that will continue in Washington, D.C., with talk on weightier issues. China and the United States remain at odds over economic tensions, computer hacking, human-rights concerns, the pressures on foreign nonprofit organizations in China, and the country’s increasing assertiveness in the South China Sea, where shipping lanes cement global trade. Xi’s visit jammed up highways for a second straight day. And a few hundred demonstrators waited for him in Tacoma outside the school, protesting everything from China’s record on religious freedoms to the country’s growing regional presence in Asia. But pressing geopolitical concerns were left at the door of Lincoln High’s gymnasium Wednesday, Xi’s first stop at the school. Players of the school’s football team presented Xi with a jersey bearing his name and No. 1 — and made small talk through a translator. They even talked a little football, according to Dionte Simon, a 17-year-old running back with the Lincoln Abes. Xi may have seen that game when he first visited Tacoma in 1993 as a lower-level party official. That visit came just a year before Tacoma and Fuzhou, the city where Xi lived at the time, became sister cities. Between his stops in the gym and the auditorium, Xi visited a classroom, where he said he met students, he said, eager to learn about Chinese civilization. Kim Nguyen, a 63-year-old retired custodian originally from Vietnam, was protesting the visit. He said he worried about China taking away American jobs. A few minutes later, the school bell rang to end the day early, sending hundreds of Lincoln students pouring onto the sidewalks and into the middle of the protests. Component post 9761871 could not be found. Some students followed along with the arguing demonstrators, others joked and took selfies with chanting protesters in the background. 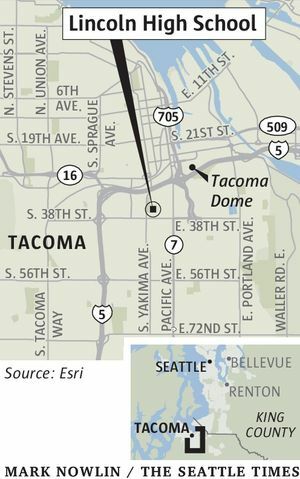 A block away, the commotion could barely be heard by Korlina Wilkinson, a 50-year-old Tacoma resident who works in construction. Outside clearing morning glories from her yard, Wilkinson said she’d heard of the visit on the news and had seen some protesters walking by.